All transactions are safe and secure with a reliable history in online purchasing behind each of our associates. 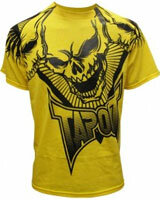 Buy the TapouT t-shirts to own UFC clothing and merchandise. One of the most popular pieces of Tapout apparel available, this yellow Tapout tee features the brand name near the center with an angry skull displayed above the Tapout logo. Like nearly all of the brand's apparel, this Tapout shirt is a reflection of the extravagant creativity of Tapout's founder, Mask. The back of the tee features a nearly identical but smaller version of the Tapout logo that is displayed on the front. Browse through to see this and all of the available Tapout clothing. In addition to the TapouT tees above, browse the UFC Clothing Gallery for more apparel like men's and women's clothes, kids shirts or hoodies.